Uwe and Bettina Steinmueller of Digital Outback Photo have released a second eBook in their series on Lightroom 4. The 80 page book, “Lightroom 4 Artistry: Library,” was written to help photographers learn to use the photo management tools in the Lightroom 4 Library module to better organize their photos and videos. It includes sections on importing photos, keywords, collections, ratings, plug-ins, backup strategy and more. 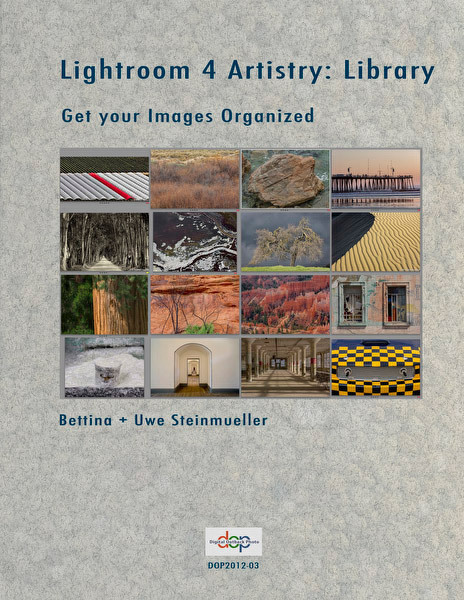 “Lightroom 4 Artistry: Library,” is an iPad-compatible printable PDF eBook. It sells for $14.95 on the Digital Outback Photo Web site and there’s a nice discount for photographers who have already purchased Uwe and Bettina’s “Lightroom 4 Artistry: Develop” eBook.